SSDs are preferred over HDD due to its low power consumption and most importantly, it's faster processing speed. But SSD used to have to major disadvantages which are low capacity and how expensive they are. Samsung however took care of the low capacity issue when it introduced its 30TB SSD which is currently the largest SSD available at the moment. Although Seagate announced its own 60TB SSD about a month after Samsung's 30TB announcement, but it's not yet available for consumers. Now, a company called Nimbus has just announced a new SSD with 100TB storage capacity. This announcement sets a new record in terms of SSD storage. The Nimbus 100TB SSD which goes with the model number DC100 has already started to reach customers of the company in form of samples and Nimbus has also promised that mass production of the drive will begin pretty soon. To achieve this capacity, the company has used NAND 3D MLC memories manufactured by SK Hynix. With this new capacity, you can store up to 20,000 HD movies, the drive also has sequential read and write speeds of 500 MB/s when using SATA interface, as well as 100,000 IOPS. In addition to been more than three times larger in capacity to the highest available option currently, its energy expenditure is much lower; in particular, it is 85% more energy efficient per terabyte. The power consumption might be the only downside here but that's expected considering the size. The unit consumes 10 watts at rest and 14 watts in operation, something similar to what a high-performance hard drive consumes, and about 5 times more than what an SSD consumes than we can have on our PC. 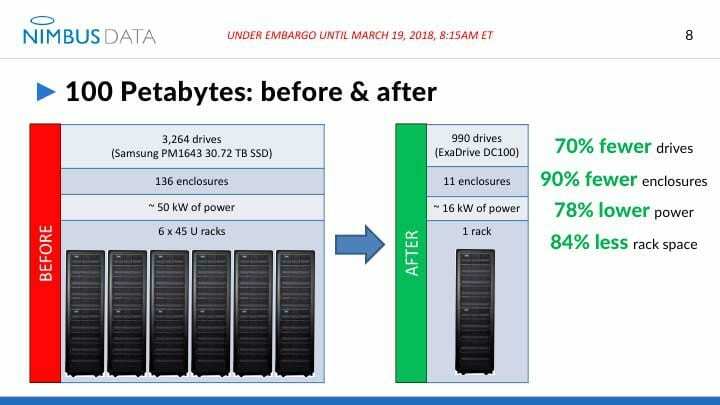 Aside the 100TB version, the company will also be marketing a much smaller 50TB version which is still much larger than the 30TB SSD from Samsung, which is currently the largest available option at the moment. As most of us already expect, this drives are not going to be cheap at all. Even though the company has not announced the official price yet, it's price is currently being estimated not to be anything below $25,000. Nimbus also promised to commence sales this year which is really going to be a great achievement considering the fact that Samsung stated sometime ago that a 100TB SSD won't be possible until 2020.